Tempus Two Winery represents a bright new chapter in one of Australia’s most exciting wine stories. 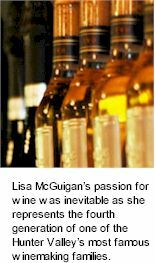 Lisa McGuigan’s passion for wine was inevitable as she represents the fourth generation of one of the Hunter Valley’s most famous winemaking families. Before turning to the industry ingrained in her soul, she spent a decade pursuing a career in hospitality and five star hotel management. It was during this time that she conceived Tempus Two - right down to the tiniest detail. Sharing the vision is the Roche family, creators of the multi-award winning Hunter Valley Gardens and now developing some of the Hunter Valley's finest wines. Their passion for the area is seen in the commitment to building first class facilities so it was inevitable that the two families would unite in wine and wine tourism. Roche Wines include the historic Tallawanta vineyard, the revered Stevens vineyard and the recently redeveloped Harrigans Hill vineyard. The range includes the highly awarded Roche Premium range, including the benchmark IJR and WR Hunter Shiraz, the Tallawanta range and the fun new Harrigans Hill range. The award winning structure is comprised of a state of the art boutique winery, cellar door, Oishii - Japanese and Thai Restaurant, and 10,000 seat amphitheatre. The winery features a range of cultural events throughout the year including themed dance nights, community art shows, drama and theatre productions. Tempus Two also hosts a variety of functions from private weddings and celebrations, to corporate dinners, conferences and product releases. At the centre of the facility is the Cellar Door, home of Roche and Tempus Two Wines. Entry is greeted by guitars and/or funky chill-out beats that fill the air and create a unique, modern atmosphere. Beyond the glass doors lies an intricate floor mosaic. The estate's trademark handcrafted Italian bottles with distinct Copper and Pewter labels are all about a combination of new-wave winemaking techniques and innovative packaging. The dynamic winemaking team put care and effort into sourcing only the finest quality grapes, from the Hunter Valley and Australia wide. 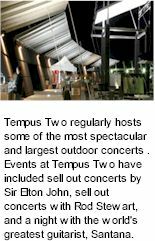 Tempus Two regularly hosts some of the most spectacular and largest outdoor concerts staged in Hunter Wine Country at the 10,000 seat, magnificently architected amphitheatre. These events feature a number of the world’s best known performers and are much more than just a concert. Coupled with the performance by the headline act is a range of dining options, from five star degustation dinners prepared by a number of the Hunter’s leading chefs, to outdoor food stalls operated by a number of restaurants from around the Hunter Valley. Everything can be found on offer, from sushi to steak sandwiches and much more. Patrons can experience at Tempus Two, so much of what the Hunter has to offer. The day features performances by various support acts around the venue, extensive bars offering a range of wines, beer, soft drinks, espresso, cheeses, cakes and more. Tempus Two combines great wine, food and entertainment in a modern and comfortable facility; a realisation of two families united vision, to create a unique destination in Australia’s premier wine region, and to support Hunter Valley tourism.